While in Cuba this past July, I had the pleasure of seeing the all-female group, Obini Bata, perform at Havana?s Yoruba Cultural Association. Obini means ?woman? in the Yoruba language of Nigeria, and Bata is the name given to the hourglass-shaped drums that accompany Yoruba dance and song. The culture of Bata drumming originates with Africans who were brought to Cuba as slaves. However, women have historically have been banned from playing the Bata. At some point, it was decided to sanctify the Bata drums for the purposes of playing them in Afro-Cuban religious ceremonies. Justifications for prohibiting women from playing the sacred drum included beliefs about women bleeding, and being subject to mood swings and generally unsuited to communicate with the deities. Of course there is no inherent reason why women cannot play these drums and the ban is simply an inherited form of gender discrimination. When Obini Bata was founded in June of 1993, it was the first all-female group featuring Bata drumming. Eva Despainge Trujillo, Artistic Director, left the Conjunto Folklorico Nacional de Cuba (the National Folkloric Company of Cuba?until today a reference point in Cuban dance and culture) to found Obini Bata. She explained that chauvinistic attitudes have followed the group throughout its history. Unfortunately, some Cubans?both men and women?have not been able to separate the group?s use of the Bata drums for an artistic purpose as opposed to a religious one. As Eva stated, ?we put the religious world on stage as art.? When asked if the group performs elsewhere, (internationally, etc. ), Eva joked, ?Yes, we travel, but we perform mostly in Cuba. Actually we perform mostly in Havana. Actually we perform mostly right here where all of us are right now, in the Yoruba Cultural Association.? Except for when they are out of town, Obini Bata performs regularly, every Friday night, at the Yoruba Association, a cultural center and museum highlighting Afro-Cuban culture, a cornerstone of life which Cubans celebrate and are proud of (seemingly even Cubans of European descent), unlike in other Diasporic countries where these cultural riches have often been sublimated, repressed or stamped out. The day after I saw them perform, Obini Bata departed on an international tour, this time to France. I assumed that they would be part of some festival or invited by a cultural organization, but no? arrangements had been made by Cuba’s Ministry of Culture for Obini Bata to perform for the French Electricity Workers Union. An expression of artistic solidarity with the workers of the first world? The group seemed neither overjoyed or discontent about the upcoming trip (but then again maybe they were just tired from the evening?s performance) but the conversation did segue into the topic of how and why the Cuban government seems to promote some artistic and cultural groups over others. Although Obini Bata has had some opportunities to travel abroad, they haven?t exactly felt the love that they feel they deserve, a sentiment I also heard expressed by other Cuban artists and performers who are not part of the A list international touring circuit in the same way that the Buena Vista Social Club or the National Ballet of Cuba are, for example. But in Obini Bata?s case, the group members explain any lack of good standing in part because of machista attitudes that, although waning, still classify their use of the Bata drum as problematic. On a more personal level, I felt a connection to the Obini Bata performance not only because these female artists defy cultural norms and gender stereotypes, while reclaiming a cultural heritage that is much theirs as anyone’s, they exhibited a contagious joy, each one interchanging roles as dancers, singers and drummers. It?s rare for this distinction to be blurred to this degree?by the time they become professionals, artists typically must choose if they are a dancer or a musician. Eva explained that Obini Bata was founded expressly for this purpose?so that as dancers they could play too, and be fully fluent in all aspects of their artistry, culture and performance. As a dancer first, I appreciated Eva?s quip that it?s easier to teach a dancer to play music than to teach a musician how to dance?explaining that all of the women in the group (except one) were trained as dancers and learned music later. The exception is the lead percussionist who Eva complimented by saying that she works very hard everyday, training right alongside the others and has evolved into a beautiful dancer, as anyone in the audience could appreciate. While watching the performance I couldn?t help but think of my dear friend, Neia Naene, in Mozambique, member of the all-female drumming group, Likute. When she?s not playing with Likute, Neia is one of the few (if not the only) female bass players in Mozambique and also rehearses with a traditional Mozambican dance group. My vote would be to forget about the French Electrical Workers Union and finance Obini Bata and Likute to create some girl-power Afro-diasporic fireworks of their own. (Likute is on Facebook and can be contacted at likute09@gmail.com). Like African percussion, Bata drumming is polyrhythmic, featuring three different types of drums, each one with its own tone and associated rhythm. As is customary, Bata drumming and song opened the performance which segued into dances of the Orishas?gods and goddesses of the Afro-Cuban religion, Santeria. Santeria has its roots in the religious beliefs that Africans brought to Cuba, which were layered over Catholic iconography and doctrines, eventually forming a new syncretic hybrid. (Each Afro-Cuban god has its Catholic counterpart?for example St. Peter is represented by Ogun, the Santeria warrior god.) This mix of Yoruba and Catholic beliefs has sister equivalents in much of the Caribeean and beyond, including Brazil?s Candomble and Vodou of Haiti. 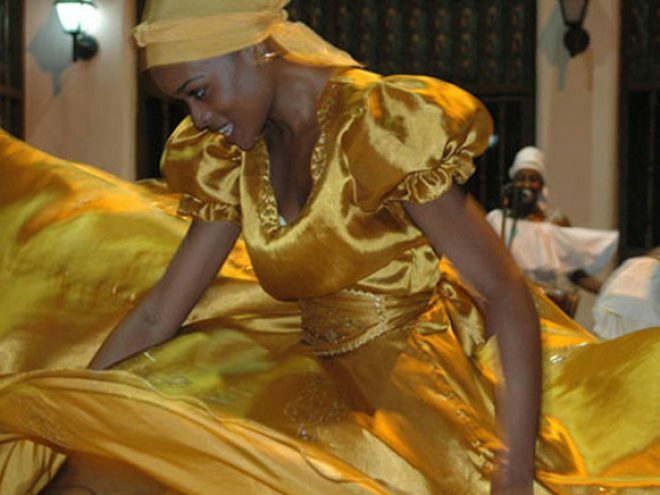 Of course the Obini Bata performance featured the sensuous and powerful dances of the female goddesses?Oshun (the goddess of love and beauty whose color is yellow and Yemenya (the goddess of the sea?blue) being the most important and frequently represented in Cuba. There was also a performance by a ?young Yemenya? who, in her formative stage, is the goddess of an unsettled and stormy sea. This performance and accompanying music was done entirely by a troupe of younger female dancers that Obini Bata frequently invites as guest performers, who are endearingly referred to as ?Las Obinises.? In this way Obini Bata ensures that the tradition of female Bata drumming and Afro-Cuban dance and culture is passed on and continues. Since Obini Bata?s founding, other female Bata groups have emerged, many under the tutelage of Obini Bata, whose members have traveled throughout the Cuba with the purpose of empowering female artists with their unique brand of Afro-Cuban culture. Also part of the Obini Bata repertoire is a contemporary interpretation of the dance of Oya, a warrior goddess of wind and storms. Wearing military green (instead of Oya’s multi-colored skirt) and wielding machetes, the Obini Bata women paid homage to female heroes who fought in the Cuban revolution. The second act of the performance featured Cuban popular dances, including the ?Danza de las Chancletas,? (Dance of the Sandals) in which the dancers wore wooden flipflops (apparently a typical vestment in Cuban households of yesteryear) that made a delightful percussive sound similar to tap or flamenco. After the performance when I talked to some of the members of Obini Bata, I had a chance to learn a bit about their training and how they ended up in this particular company. Almost all of them had earned their college degree from the National Arts School, with an emphasis in dance?an education which they had received at no personal expense. When asked what she looked when hiring a dancer for her company, Eva responded that she ?looks for the education that comes from a school but a heart that comes from the street.? And after seeing these women perform it was clear that a passion for dance, music and culture runs deep in all of the Obini Bata women, a sentiment that was echoed by one of the members who, when asked what she would like to do as a profession if not for dance, responded that she couldn?t think of another option and she would die without dance. And despite any criticisms of government favoritism and being victims of ?machismo,? it was evident that these women are passionate not only for their art but also for their country. When one of the dancers was asked if she would ever be interested in coming to the U.S., she first clarified if the question was about living or visiting the U.S., ?to visit, of course, I would love to but to live, no. Cuba has given me everything and I love my life here.? Her response was immediate, pure and authentic?this was not about U.S. vs. Cuba propaganda. For the women of Obini Bata, as for many of the artists who I encountered in Cuba, their country has given them the greatest gift?the gift of developing their self-expression to its fullest potential through their chosen art form. For this reason, the women of Obini Bata seemed incredibly grateful and almost giddy for their lot in life, and among the happiest and most satisfied (in non-material terms) of the Cubans I met.